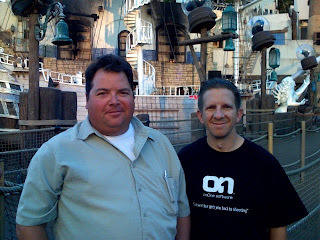 Here's a picture of Brian and Allen at the Treasure Island (TI) outdoor show "Siren". It used to be the famous "Pirate" show, but they revamped it to entertain the more mature audiences as these semi-bikni clad beauties swinging through ropes and dances toe hip-gyrating music. Of course, we picked the wrong side and got a good view of people's heads rather than the sirens. We did, however, got a real good look at the guys who played the pirates on the opposite side. I would rate this 2 out of 5 stars for entertaining value. That's only because it's also free but you'll have to get there early to catch the show. P.S. the Wisconsin College team and alumni were here to open the show as they will battle against UNLV tomorrow.